“Super Glasgow!” Ian brown walks onto the stage in a city that has always supported him and The Stone Roses. Glasgow Green in 1991, and again in 2013, this time Scotland’s national stadium hosted the band. 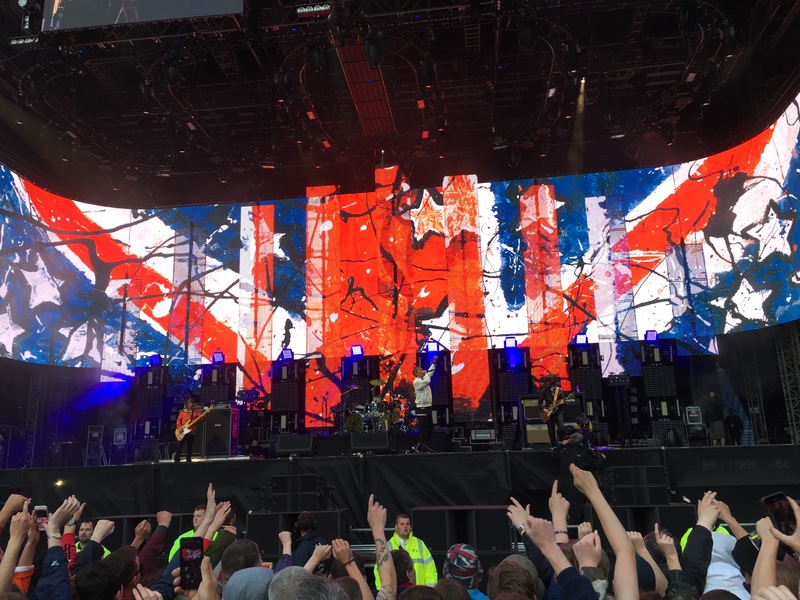 From their reformation; the famous 3 gigs at Heaton Park in 2012, The Roses have had their third coming. 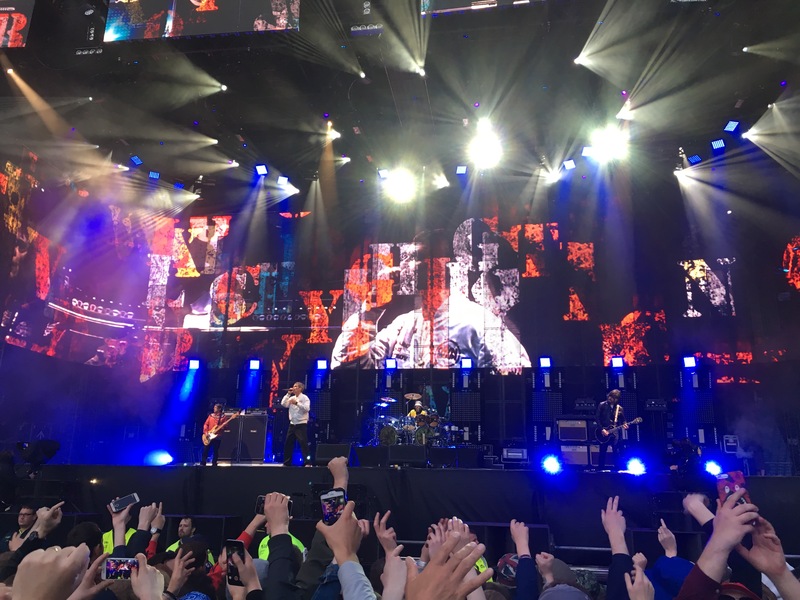 But with rumours of a potential split surfacing after dates at Belfast’s SSE arena, Wembley and two nights at Leeds Arena, the gig itself was to be far more iconic than first thought. Supporting them, Primal Scream, the Glasgow rockers have been around a similar length of time to The Stone Roses, give or take a 18 years in the middle, but Bobby Gillespie has aged well. Bright red flares and a flowery top he is Hampden Park’s focal point, ‘Movin’ On Up’ sees him ask the crowd to replace the gospel choir on the recording. “Enjoy the Roses”, he says in his recognisable soft rock and roll voice. They look after their own in Glasgow, this was no Hampden Old Firm clash, the stadium is full to applaud Primal Scream off, and there’s barely anyone moving from their space in the front circle as the clock ticks towards nine. 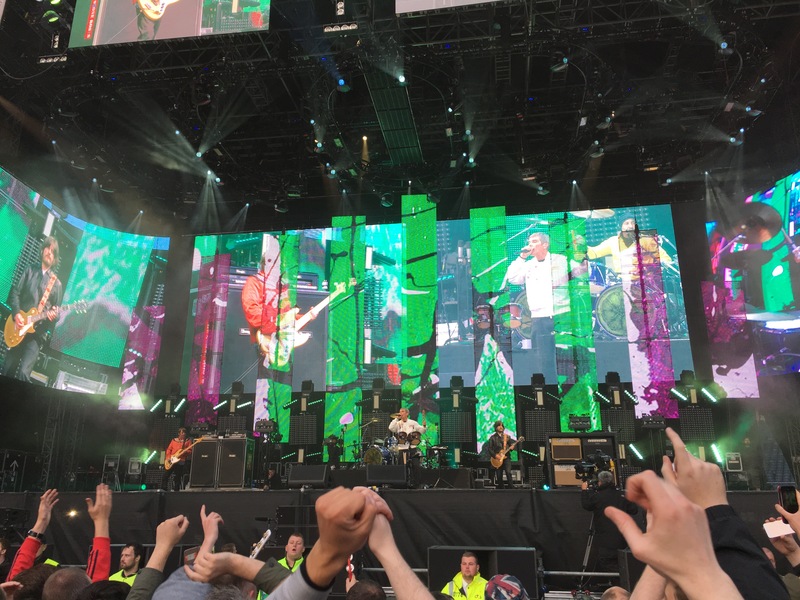 The resurrection of The Stone Roses has been somewhat soundtracked by one song in particular, and as the tones of The Supremes swirl around Hampden the band take to the stage, Mani first, then Reni. John tunes up for a final time, Ian enters from the left. Super Glasgow. Then, Mani’s bass, and it comes as flares ignite in the crowd (not Bobby Gillespie’s). A sea of colour, adoo-oo-oo-red. An early highlight is ‘Elephant Stone’, the way the band have altered versions of their hits has been fascinating and this song sounds like the child of ‘Sally Cinnamon’ and ‘Fool’s Gold’ more than ever. The lyrics of ‘Where Angels Play’ are those that were featured on the original demo, a hell of a long time ago. But something seems different, and as Ian monkey-mans across the stage during the set, he is not waving to the crowd like usual, but waving as if to say goodbye. Then he mutters a comforting few words. Exactly as I thought, the set grows more and more significant, each second of ‘Fool’s Gold’ is savoured. 2016’s ‘All For One’ is followed by 1994’s ‘Love Spreads’, then what will surely be a moment to remember forever, ‘Made of Stone’. The Stone Roses are untouchable, and before I was born had already combatted any criticism that would ever follow. Ian’s voice? No new tracks? Split, rows, reunion, they remain the band I’ve always known, and since Ian sat at a press conference and said, “our plan is to shake up the world”, they have kept their legacy pristine and given so many like me that chance to enjoy moments like this. Should last night be the last night, they have bowed out in style. ‘This Is The One’, this is the one, the last one? The end of the song sees Ian Brown on a pair of African drums next to his microphone, an extended introduction to what may be the last song The Stone Roses ever play. It is an intro that has always been bittersweet, one the one hand you know you’re about to hear one of the best songs of all time, on the other, the set is coming to an end. The chorus is roared back to the stage, the bridges that cross the Clyde in the city centre shake, The Stone Roses are in their last seconds. The final words that Ian Brown sung at the front of The Stone Roses are those from their final recorded tune, ‘Beautiful Thing’. If you know, you know. Mani takes a last look at the crowd and covers his face, his emotion has always been there, from walking onto Glasgow Green punching the air, his tears will be the image of the end of a band that has given so many so much. 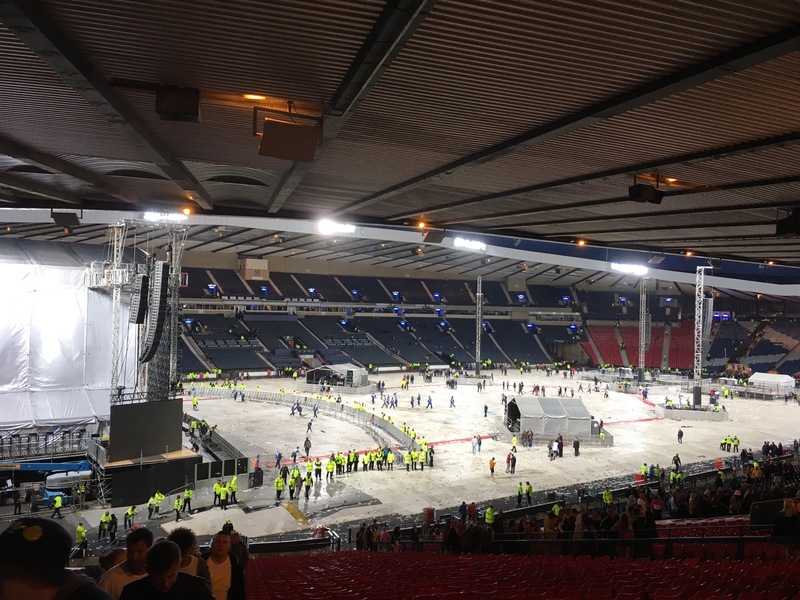 As the stadium empties, the white floor of Hampden becomes visible, the June sky is still light, faces are still smiling, still singing. The Stone Roses may be no more, but they’re not gone, they never will be. They’re alive every time the needle drops on that debut record, every time ‘She Bangs The Drums’ comes on a pub jukebox, every time you remember climbing into a minibus or squeezing onto a MetroLink carriage on the way to Spike Island or Heaton Park or Glasgow Green. 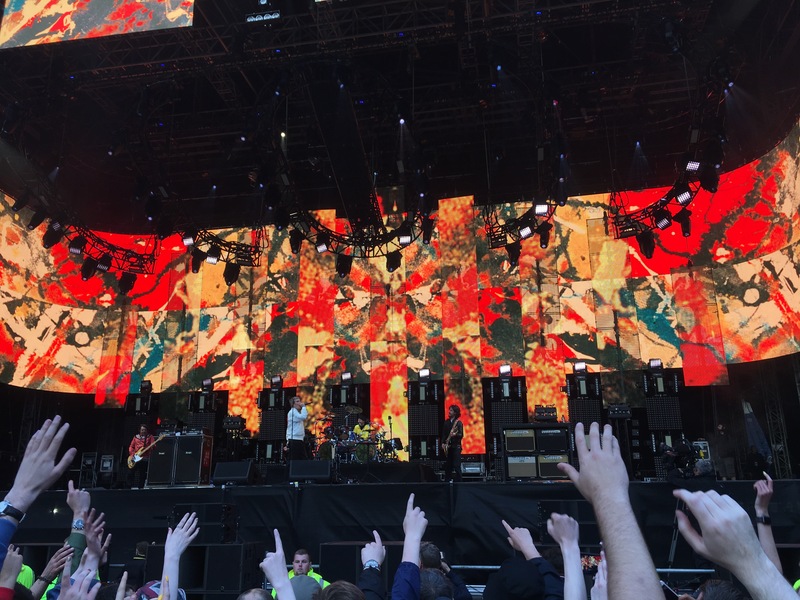 The Stone Roses might have come to an end, but they’ll never really be finished.